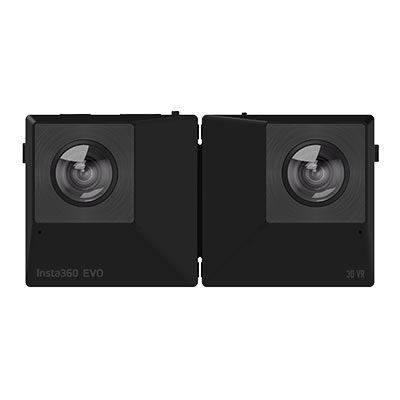 The Insta360 EVO 3D is a pocket-sized compact camera that captures 180° 3D as well as 360° 5.7k videos and 18-megapixel photos, both with image stabilisation. Folded with lenses on the front and back it can shoot immersive 360° media, unfolded it locks into place to capture 180° 3D. It includes twin microphones, a MicroSD slot and a tripod thread mount. Folded it measures around 5cm cubed, unfolded just under 10cm wide whilst weighing just 113g. Connect your smartphone to the EVO via bluetooth for full control via the app available on android and iOS. Its 1200mAh battery provides 65 minutes runtime and takes 90 minutes to charge. Good stabilisation is essential for both 360 and 180 3D content, especially when it’s viewed in a headset. That’s why EVO uses FlowState Stabilisation, the industry-leading tech that captures footage so stable it looks gimbal-mounted. Thanks to its 6-axis in-camera stabilisation and 100Mbbps video bit-rate, this device will appeal to consumers and professionals alike. A simple 3D VR glassed adapter is included in the box, allowing you to use your smartphone to preview VR content. When you shoot an ultra-wide 180 or 360 field of view, accurately capturing the full range of lighting information in a scene is especially important. EVO uses best-in-class HDR video capture technology for both 180 and 360 shooting modes. Scenes look natural and vibrant in every direction, with no post processing necessary. HDR photos are also supported for both 180 and 360 shooting modes. The EVO's companion app makes capturing and editing great moments easy. WiFi connectivity lets users see what they’re capturing on EVO in real time, and then quickly transfer footage to their phone.